Unlock your cell phone and switch to the network that best suits your current needs. Take your phone with you and avoid signing a contract with the network. Use any SIM card on any GSM network in the world. Remove network restrictions and increase your range of service. Target more potential buyers by increasing the resale value of your Toshiba. How to unlock my Toshiba phone with doctorSIM? Releasing your Toshiba from its network is as simple as 1-2-3. Submit your unlocking request in 3 steps and then insert the unlock code into your cell phone following our simple instructions. There's nothing more to it! How do I request an unlock code for my Toshiba phone? First, to check availability you need to know the country and network to which your cell phone is locked. Then, if your Toshiba can be unlocked using one of our unlocking services, complete the fields in Step 2 including your phone's IMEI number (if you don't know it, just type *#06# on the phone's keypad to obtain it). Finally, select your preferred secure method of payment to submit your request. Will I get my money back if you cannot unlock my Toshiba cell phone? Yes, we will issue you a full refund if for any reason under our responsibility we are unable to unlock your Toshiba. Do I need to know the exact model of my Toshiba device? You don't need to state the exact model of your Toshiba as the instructions on how to insert the unlock code are the same for all models. The code you receive will depend on the unique IMEI number of the phone, so make sure you send us the correct number by typing *#06# on the phone's keypad. What is the timeframe for unlocking a Toshiba phone? It will depend on the country and network carrier your cell phone is locked to. The Guaranteed Delivery Time will be displayed on the screen once you have selected the network provider to which your phone is locked. Could my Toshiba device relock at some point in the future? No, unlocking via IMEI is 100% permanent. A one-time event, your Toshiba will be unlocked forever once you've inserted the unlock code! If I unlock my Toshiba cell phone, will it work on any network in the world? 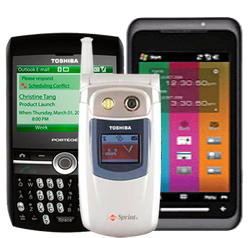 Once unlocked, you'll be able to use your Toshiba cell phone on any compatible GSM network in the world as long as it has not been blacklisted due to loss, theft or unpaid bill. If you are unsure if your phone has been reported by the original carrier, remove all doubt using our free Toshiba phone blacklist check. My Toshiba phone has been reported due to non-payment. Can you still unlock it for me? Reports are additional security measures which prevent the cell phone being used properly and are not removed by network unlocking the phone. If your Toshiba has been reported due to an outstanding bill, you should contact the carrier to which the phone is locked to settle the bill. You can still unlock your phone from the network, unfortunately, you just won't be able to use it until it has been removed from the blacklist. Global market leader for over 10 years. Capable of unlocking over 6,000 devices worldwide. Great discounts for bulk unlockings. Keep your Toshiba with you during the unlocking process.